Below are some answers to our most frequently asked questions. If you still need help, don’t hesitate to contact us. How do I program my TAPS PRO switch? Does this work with _ _ _ _ _ Laser? TAPS works with any laser system that accepts the standard Crane / Insight / L3 pressure switch connector. Does this work with _ _ _ _ _ Light? TAPS currently supports Surefire & Insight Lights. More light options may be added in the future. TAPS and TAPS Pro are waterproof to 1 meter for up to 30 minutes when properly assembled on a rail. Battery life for the 2032 Battery in TAPS Pro is approximately 3000 hours of device “ON” time. However, we suggest changing the battery yearly. I am using Double Tap for Constant and my laser remains activated and I cannot turn it off! Double Tap for Constant should not be programmed for devices that have a native Double Tap for Constant feature. Momentary mode should be used for these devices to utilize their internal programming and achieve Double Tap for Constant functionality. Why is there a gap between the body and the baseplate of TAPS Pro when I assemble it? It’s likely the O-Rings are not seating fully. Check to ensure there are no twists and ensure a light coat of grease is applied on the entire surface of the O-Ring. The Light or Laser fades in / out while in Constant On mode. The CR2032 battery in TAPS needs to be changed, or it is making imperfect contact. Use only high quality batteries. I cannot get TAPS Pro to enter programming mode? 1. Ensure the battery is fresh and high quality. 2. Ensure the battery is properly installed and the switch is mounted on a rail and that the O-Rings are seating fully. 3. Ensure you press a “Fire” button immediately prior to pressing the programming button. I am having an issue with TAPS that I cannot find an answer for? Please visit the TAPS Tech Support page and fill out the form. We will respond ASAP. Will MARK work with Howard Leight ear pro? Yes, but it may require the user to put a slight bend in the wires at the end to provide tension to the clips. I have _ _ _ _ _ Helmet and _ _ _ _ _ Ear Pro, which SKU should I purchase? Do the MARKs click out into the open position? No, but they can be set on the lip of the helmet to allow cooling while still being able to hear comms. 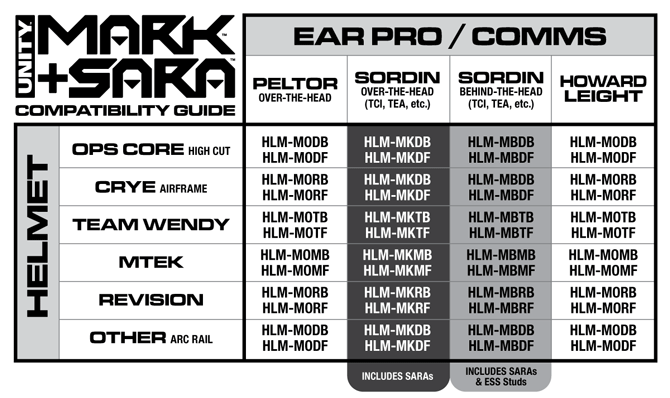 Which ear-pro / comms are SARA's required for? Only MSA Sordin and Sordin derivatives. The inner cir-clip is really difficult to get off? Snap ring pliers will make things substantially easier. These are commonly available at most hardware stores including Harbor Freight, Home Depot, etc. In lieu of that, a small flat head screw-driver will work. What are the ESS Studs? ESS Studs are required for “Behind the Head” ear-pro / comms only. They replace the rear stud on each ear cup for use with SARA. Can I mount KNUCKL and MARK on my Team Wendy helmet? Unfortunately this is not possible. Please use the REMORA for this application. What is the included velcro dot for? When KNUCKL is loaded with heavier items (Contour Camera & X300 for example) the velcro dot can be placed on the Contour camera to help secure it to the helmet for the best video experience. No, but it will help retain the items in the event of a break-away and is highly recommend for hard use environments. Please see the sizing guide located on the product page, or contact us for assistance. How do I use a kydex holster with CLUTCH? 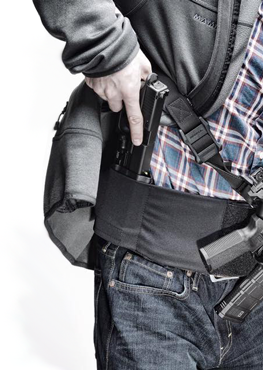 Most kydex holsters can be used, as long as they are less than 4.5″ wide. Simply remove the existing holster hardware and attach the included self adhesive velcro to the back of the holster and insert into a CLUTCH cell at the desired depth/cant. I would like to Mount _ _ _ _ _ Light in conjunction with _ _ _ _ _ Laser on my rifle. Which parts do I need? No matter your configuration, you will need the Micro Hub. If you are using a Surefire Scout series light (or light that shares that mounting pattern such as the Streamlight Protac Rail) you will not need any additional parts. If you would like to mount a handheld light, you will need the appropriate sized ring mount. If you would like to mount a picatinny rail mounted light, you will need the Offset Rail. If you are using the Micro Hub in conjunction with a Laser device, the Light Wing (Left or Right depending on side) will mount the light alongside the laser system. If I mount a DBAL to the top of my Micro Hub, will I need any other parts to mount a light? Yes, you will need a Light Wing for this to work properly. The screws do not seem to fit? When the Micro Hub 2.0 was launched, we used different screws. If you have the old screws (larger head) contact us and we will get some of the new screws out to you. Do you make an adapter for _ _ _ _ _ optic? The only adapters we currently make include what is up for sale on the site. We are constantly looking at adding new options based on customer demand, so please contact us if you have a suggestion. Should I adjust the trigger bar? ALWAYS check trigger cruciform/striker engagement when changing ANY triggers, slides, or frames on your Glock pistol. We highly recommend using a gunsmith backplate (orange) to check and verify proper striker engagement prior to firing any new parts combination. There are tons of articles and videos online with in-depth engagement verification and adjustment instructions. My adapter plate seems to be too tight? If your adapter plate does not slide into the dovetail freely, ensure that both adapter and dovetail are clean and free of debris. If it is still too tight, you may need to touch up the mounting surfaces of the adapter with a very fine file or sandpaper. Go slowly and check fit often, and the result will be a perfect gunsmith quality fit. You can see our handy guide here: ATOM Adapter Fitting Guide. If the adapter seems to be extremely oversized, please contact us so we can take a look and make sure everything is in spec. Which Lights will EXO work with? EXO is compatible with the following lights: Surefire X200, X300, X300U-A, X300V. It is not compatible with the new X300U-B (With Thumbscrew Mount). We do not currently make EXO for the Streamlight TLR series lights. Will the VFG work with MLOK? Yes, it will work on any rail that has a hole large enough for the mounting screw to fit through and enough space on the inside to mount the nut. Note, the VFG does not use MLOK hardware and rail removal will be required for most installs. How Long is the VFG?